Fiddler Dave recently alerted me to Molasses Creek's Spring Northeast Tour. In March and April, Molasses Creek will be on the road for about a month, traveling to the hopefully not-so-frozen north for a spring tour. Below is the list of places they currently have engagements. Feel free to contact Fiddler Dave at info@molassescreek.com if you see a date opening and are along the route. They would love to add more concerts, fundraisers, and school residencies to the trip! Molasses Creek has also just released a promotional sampler video. You can watch more of them here: http://www.molassescreek.com/videos.html. Feel free to direct events planners to the video if they are not familiar with this outstanding musical group. Our latest Ocracoke Newsletter is the story of Sam Jones, Island Legend. You can read it here: http://www.villagecraftsmen.com/news012111.htm. Last week Pepper Cory from Beaufort, NC was on the island teaching a Heritage Craft Class on Quilting, with a concentration on the NC Island Lily pattern. About a dozen women took advantage of this opportunity, meeting every day at the Ocracoke Community Center. My daughter Amy took a few photographs to share with our readers. You can click on any photo to view a larger image. Wednesday evening, about 8 pm, I was driving down Loop Road when I spied a critter scurrying along the ground, next to a fence. Even though I only caught a glimpse of the animal I knew it was unusual. It turned down a driveway, and I quickly maneuvered my car so my headlights gave me a clear view of this cat-sized creature with a naked, pinkish tail darting away and into the darkness. It was a possum. That may not seem so unusual...except I had never heard of possums on Ocracoke. Maybe some of our island readers will share more news about possums on the island. Don't forget...Basso in Concert, 7:30 PM, tonight, at the Deepwater Theater. See Wednesday's post for more details. 8 am until sold out! TO GO Only!! No seating inside. First come - First served! Come and support Ocracoke Child Care and enjoy an excellent breakfast!! Sunday, January 30, 12:15 p.m. Enjoy delicious home cooked food...and support our community organizations. George has done it again! He's sent me six more outstanding pictures. I wasn't going to publish any more snow photos. I think our readers have had enough, especially because snow on Ocracoke has the good sense to go away after a day or two (the ground has been bare since Tuesday). But these might more accurately be described as art photos. I know George is planning to publish these on his own blog (http://www.pixadilly.com/) sometime soon, but he's always gracious enough to pass them on to me. Enjoy! The Basso quartet will be coming to the Ocracoke Community on Friday, January 28 for performances for the students of Ocracoke School and a 7:30 PM evening concert at Deepwater Theater. It's beautiful music, they play interesting instruments (for some of you this may be your chance of a lifetime to see a theorbo up close) and, well, they're all pretty darn good! The concert will also feature special guest island musicians! This performance will include Barbara Blaker Krumdieck on baroque cello, Robbie Link on viola da gamba, baroque cello and violone (baroque upright bass), William Simms of Baltimore on baroque guitar & theorbo, and Sally Blaker on baroque cello. They will be playing works by Vitali, Platti and Vivaldi. The Basso concerts are part of the Ocrafolk Festival Winter Concert Series, made possible by the Ocrafolk Festival in partnership with the Beaufort County Art Council, the North Carolina Arts Council, the National Endowment for the Arts, and local sponsors (Peter Vankevich, DJ & Sue Jones, Skill Sense, Island Free Press, Deepwater Pottery, Robin Turner, Anchorage Inn, Bobby Rondthaler, Beverly & Leonard Meeker, & David and Susan Schwarz Jones). The Ocrafolk Festival is housed under the Ocracoke Preservation Society, a not-for-profit 501(c)3. Because of my chest cold...and then the snow storm...I hadn't been out to the beach in a while. 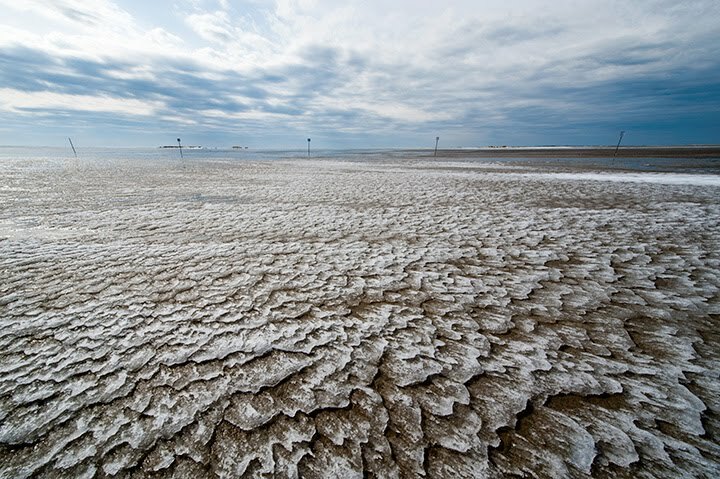 Yesterday afternoon I took a 45 minute walk along the shore. It felt so good to be near the ocean. 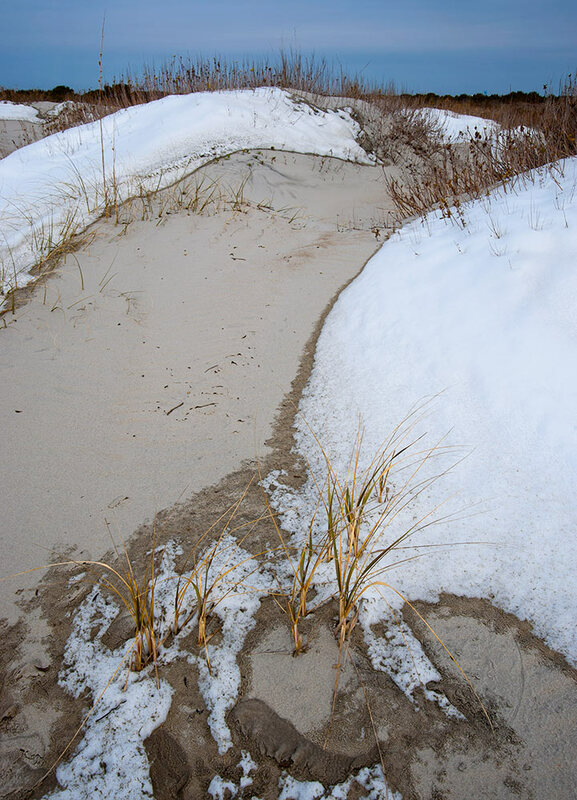 Of course, most of the snow was gone -- just patches above the high tide line and on the dunes. But it certainly makes for a different view of the beach. To my delight, there were numerous pods of dolphins swimming and cavorting offshore. Some were jumping, splashing, and even surfing. And I found a sand dollar. A Few More Snow Photos! 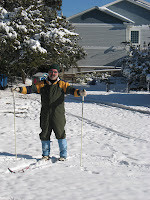 I hope our readers can enjoy just a few more snow pictures. Amy took these. Yesterday morning Dale told me he's uploaded several videos he made while driving around the village during the snow storm. 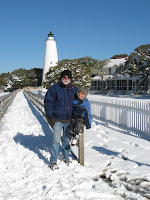 To see Dale's videos just go to YouTube and search for "Ocracoke Snow." Amy may send me a few pictures she made also. If so, I'll publish them too. 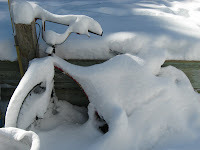 It is warming up today, and the snow will be melting quickly. Last week, while I was still down with an irksome cold and chest congestion, I had this question from a reader: "Where do O'Cockers go for medical help, hospital, specialists, xrays, Rx, etc!" We have a small clinic right here on the island, on the Back Road. Gail Covington, Nurse Practitioner, and Erin Baker, D.O., Family Practitioner, are the health care providers. We also have a dedicated and well trained staff of paramedics. The clinic is also a dispensary for medications, but providers cannot fill prescriptions from other physicians. Pharmacies on Hatteras and in the norther Outer Banks areas will fill prescriptions and mail them to Ocracoke. Oftentimes neighbors will pick up prescriptions for family or friends when they are off-island. As always we try to plan ahead! 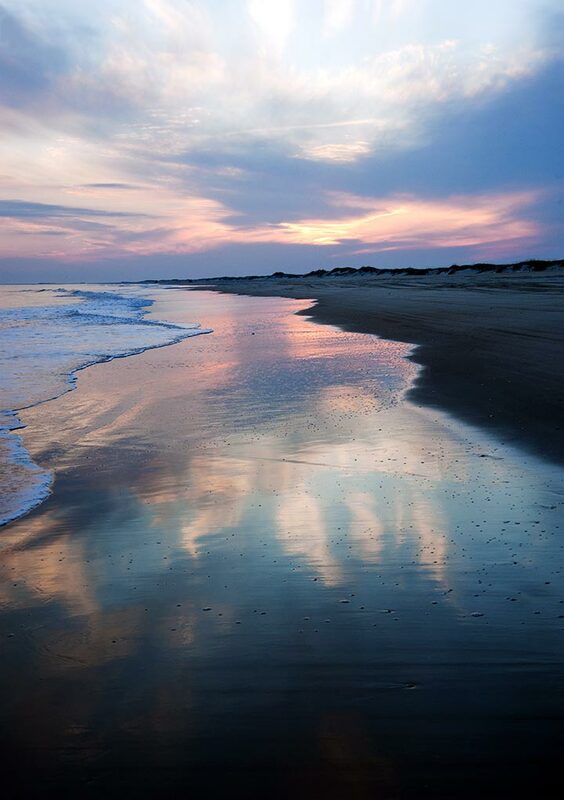 For X-rays, the closest facility is HealthEast Family Care on Hatteras Island. 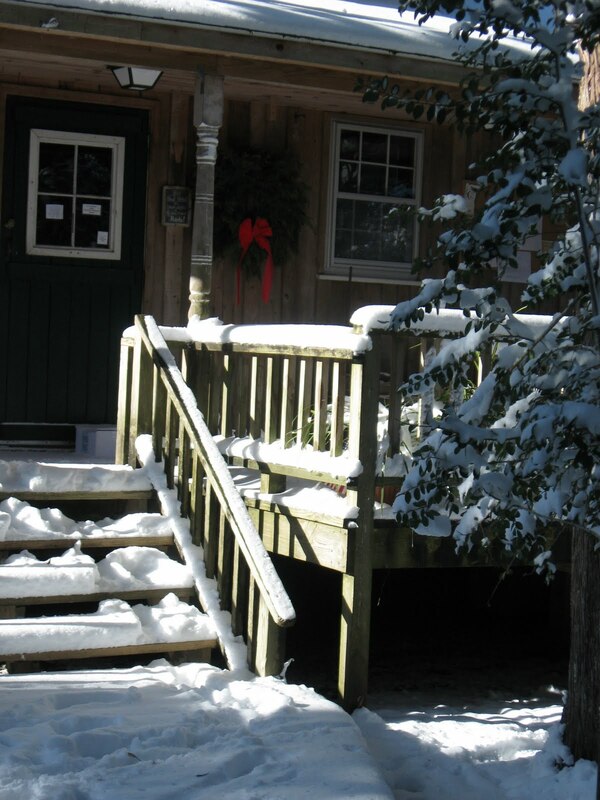 For several years now we have had a full-service hospital in Nags Head. In earlier years the closest hospitals were in Elizabeth City and Norfolk. Our EMTs can transport patients to any of these hospitals by ambulance. For more serious emergencies helicopters are sometimes brought to the island. 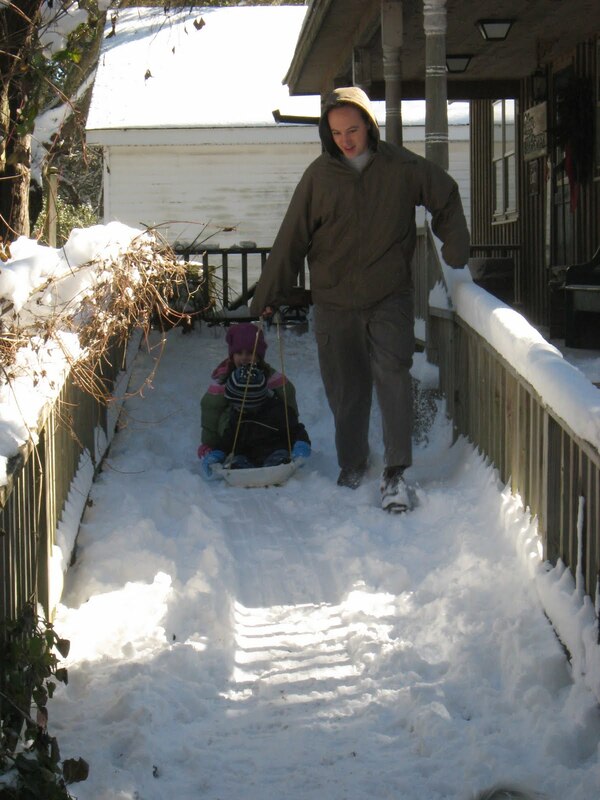 They carry patients either to the hospital in Greenville, NC, or to Norfolk. Numerous specialists practice in the northern Outer Banks areas, as well as in Elizabeth City and Norfolk. Years ago, when the mailboat to Atlantic, NC was the only transportation to and from Ocracoke, islanders relied on health care providers in Washington, NC for serious conditions. However, most common ailments and injuries were treated here on the island by family, or by the local nurse, Kathleen Bragg. We had about seven inches of snow fall yesterday. This morning Amy, Lachlan, and I (David is off-island) took a walk around the village, cameras in hand. Along the way we picked up a half dozen neighbors and friends. By eleven o'clock we were all back at my house sitting around the gas log stove, drinking hot chocolate (I think someone opened a bottle of Bailey's Irish Creme), and sharing stories. I haven't seen Amy's photos yet, but I'm posting a few of the ones I took this morning. Be sure to click on any photo if you want to see a larger image. The streets were coated with a sheet of slippery ice, but already the temperature is rising and the snow is starting to melt. Take a look at yesterday's posts to see more than a dozen photos taken during the storm. If you can't see all of the photos on the two previous posts, try clicking on them anyway. At least on my computer some of the photos don't always show up, but they're really there! I took these three pictures about 4 o'clock this afternoon. See 10 earlier photos on the previous post. We've had about 4 1/2" of snow so far, and it's still falling. Lachlan & Julian have been outside throwing snowballs. As always, click on any photo to view a larger image. Earlier this afternoon I wandered around the village and took a few photos of today's snowfall. You can click on any photo to see a larger image. Several days ago a reader asked how Ocracokers heat their homes. Many years ago islanders used fireplaces and wood burning stoves. In an 1808 deed William Howard grants the subscribers of the shoolhouse the "priviledge of giting wood for the benefit of sd [said] School house as far as get enuff for the use of the house of any kind except live oak and cedar..." Shipwrecks were also a source of firewood, although islanders could never count on that supply. 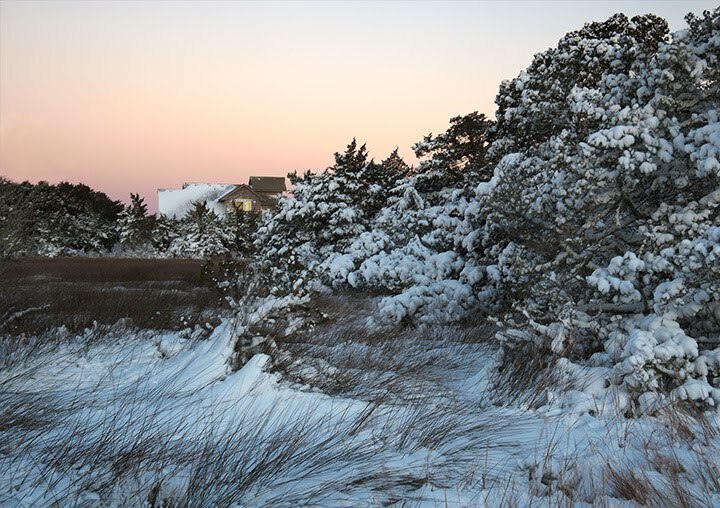 Because of the limited supply of firewood on Ocracoke coal eventually became the popular fuel for home heating. Coal was brought to the island from the mainland by boat. Coastal schooners also often carried coal as cargo. Still today lumps of coal can occasionally be found on the beach, the remnants of long ago shipwrecks. Later on, kerosene heaters were introduced to Ocracoke. "Ziegler" heaters were popular beginning in the early part of the twentieth century. A few older islanders still heat with Zieglers, though it is difficult to keep a whole house warm with just one heater in the parlor. 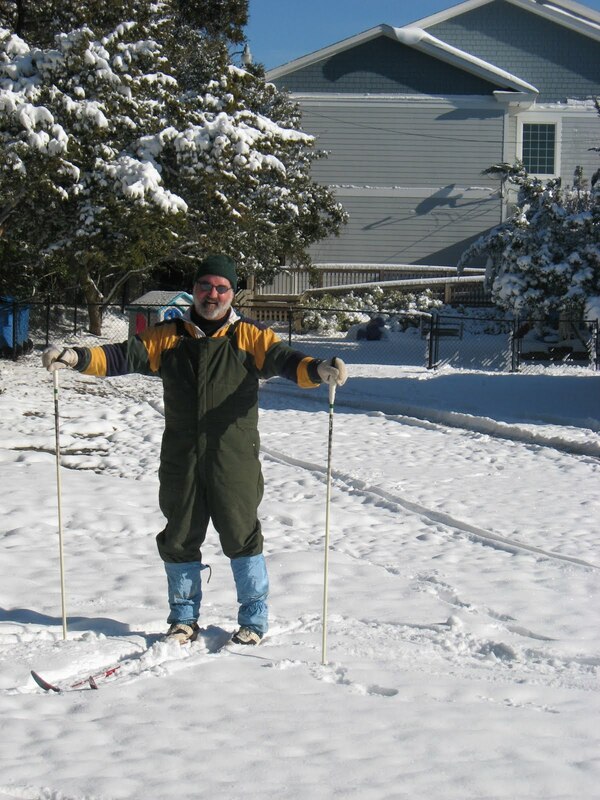 One islander, who left to work in Philadelphia in the early decades of the twentieth century, was amazed to discover that it was possible to stay warm on both sides of his body at the same time! Whole house, fuel oil furnaces eventually replaced many space heaters. These were mostly installed in the 1960s and 1970s. Today, most island homes are heated with heat pumps, either electric or LP gas. Heat pumps also provide air conditioning in the summer, a luxury my grandparents couldn't have even imagined. A number of islanders also have gas wall heaters, gas log stoves, electric space heaters, or wood burning stoves for auxiliary heat. We have just published our most recent monthly Ocracoke Newsletter, the story of Sam Jones, Island Legend. As many of our readers know, Sam Jones was a commanding presence on Ocracoke during the 1950s when he built, in the village, several large Colonial Revival structures covered with cedar shingles, and sporting numerous dormers -- Berkley Manor (near the Water Plant, and presently unoccupied), Berkley Castle (now a thriving B& B), the Homeplace (still in the family), and the Whittler's Club (today a private residence). Sam had a mercurial personality which means that numerous stories are still told about this colorful island character. I have gathered together as many of these stories as I could uncover. You can read the Newsletter here: http://www.villagecraftsmen.com/news012111.htm. As far as I know it is the most comprehensive account of Sam's life and association with Ocracoke. Yesterday afternoon I spent an hour with teachers who are attending a seminar at the Ocracoke NCCAT (NC Center for the Advancement of Teaching) campus. Their focus was on ethics, the law, and conflict resolution. I shared with them a few stories about Ocracoke, conflict, and the law. Did you know that in the 1800s Ocracoke had a designated "Wreck Master" whose job it was to oversee the collection and sale (at a "vendue" or auction) of cargo that washed ashore during shipwrecks? This was to prevent those "lawless [outer] bankers" from rounding up all the goods for themselves. 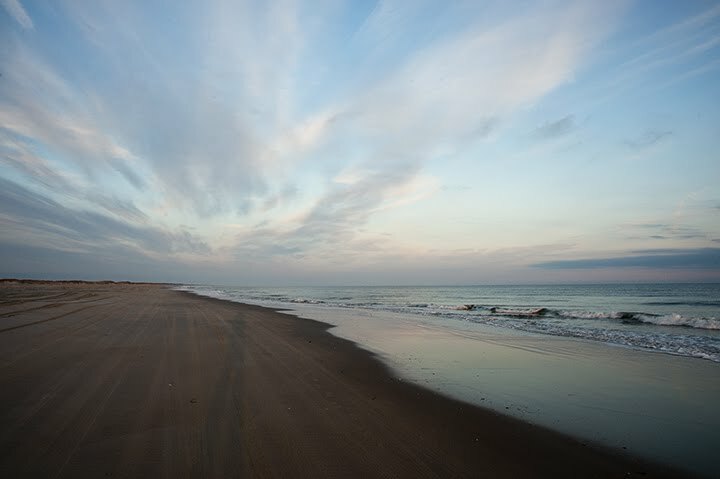 Or that for a period of 30 years (from the early 1920s until the early 1950s) Ocracoke was known as "the one place in North Carolina without any form of law?" Or that Ocracoke drivers did not need license plates or driver's licenses until after Hwy 12 was first paved in 1957? Or that the Hyde County Commissioners, responding to a petition by concerned residents, banned the sale of beer on the island in 1937, four years after Prohibition was repealed? Our latest Ocracoke Newsletter is a history of the early twentieth century Doxsee Clam Factory in Ocracoke village. You can read it here: http://www.villagecraftsmen.com/news112110.htm. I am up and about more these last couple of days, but still struggling with a lingering cough. I'm hoping the antibiotics will do the trick and defeat this irksome bug. I didn't venture out much yesterday. It was overcast, rainy (off and on), and chillier than forecast. The forecast calls for even more rain today. Unfortunately, I missed a meeting yesterday -- "Creating Sustainable Local Economies" sponsored by the NC Rural Center, the Conservation Fund, Z. Smith Reynolds Foundation, & Duke University, in partnership with Down East Community News, Hatteras Connection, the Ocracoke Foundation, and Ocracoke Civic & Business Association. The theme of the meeting centered on community based tourism and developing a creative economy. Special guest was Becky Anderson, founder of "Handmade in America." Maybe one of our readers attended the meeting and will share some of the highlights. Dad is staying in today and resting a lot. I talked to him on the phone and he sounds a bit better even after just one dose of antibiotics. We can hope that the progress will continue. It's been rainy most of the afternoon, so not the best of days for a relaxing beach walk. One a positive note, it is getting a bit warmer. We all like that! Bill Jones, my dad (Philip) and myself went for a brief walk on the beach yesterday. It was beautiful weather and a calm ocean, but no dolphins were in sight. Shortly after the walk my dad was hit hard by the chest cold he has been fighting off, so he's out of commission for a while. Hopefully he can try whiskey and honey and a good amount of rest a recover quickly. Postings on this blog may be sporadic until he's back up and running. There was a crystal clear sky last night. The stars seem extra bright and numerous when they are not viewed through the hazy summer sky. The downside is that it's so cold it's hard to stay outside long enough to fully appreciate their beauty. It's cold season on the island. Lots of folks have been coming down with nasty head and chest colds that just won't go away. Once, about 30 years ago, chicken pox entered the school and only about one kid escaped without getting it. On a small island like this, it's hard to avoid what's in the air! 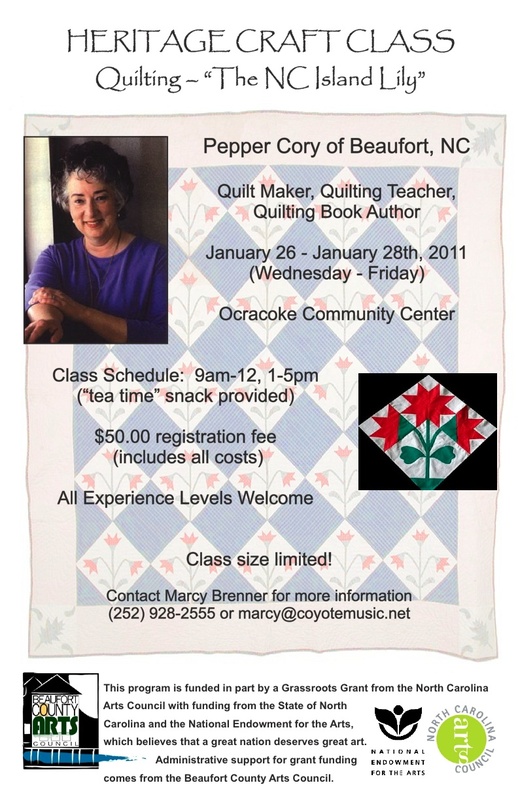 On Wednesday, January 26 through Friday, January 28, 2011 a Heritage Craft Class will be offered in the Ocracoke Community Center. The class schedule is 9am-5pm each day. Each year Ocracoke partners up with the Beaufort County Arts Council with funding from a Grassroots Grant from the NC Arts Council and funding from the National Endowment for the Arts to host, among other things, a Heritage Craft Class. This year the class will be a quilting class teaching the "NC Island Lilly" pattern. Below is a brief description of the quilt pattern to be taught. For anyone interested in signing up, contact Marcy Brenner at 252-928-2555. Click on the poster to view a larger image. On Saturday we went to Springer's Point for a quick outing. 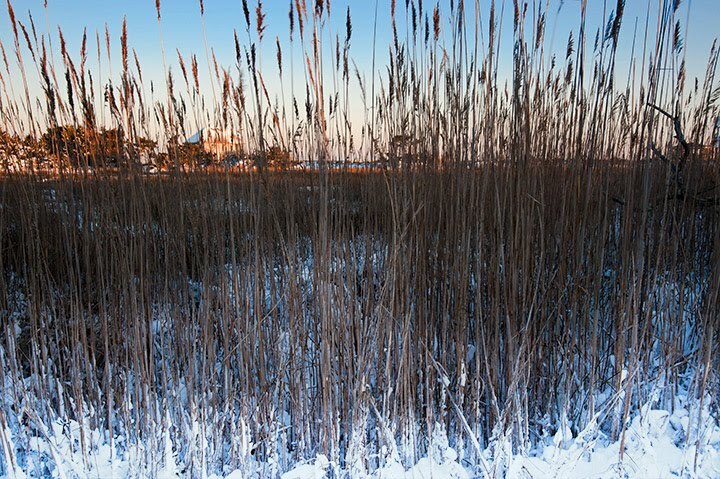 It was cold and windy out there, but the view of Portsmouth Island was crystal clear. We could even see the distinct outlines of houses. The water was also very calm, lapping gently up on the shore near our feet. Here is a little more old news, but the recent (brief) snow flurries reminded me of it. 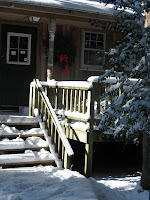 Right after Christmas we did have a dusting of snow. To most northerners it wouldn't even have been enough to notice, but to Lachlan, it was very exciting. He was up and out early throwing snowballs and discovering that even without hills, sledding was possible on Ocracoke. 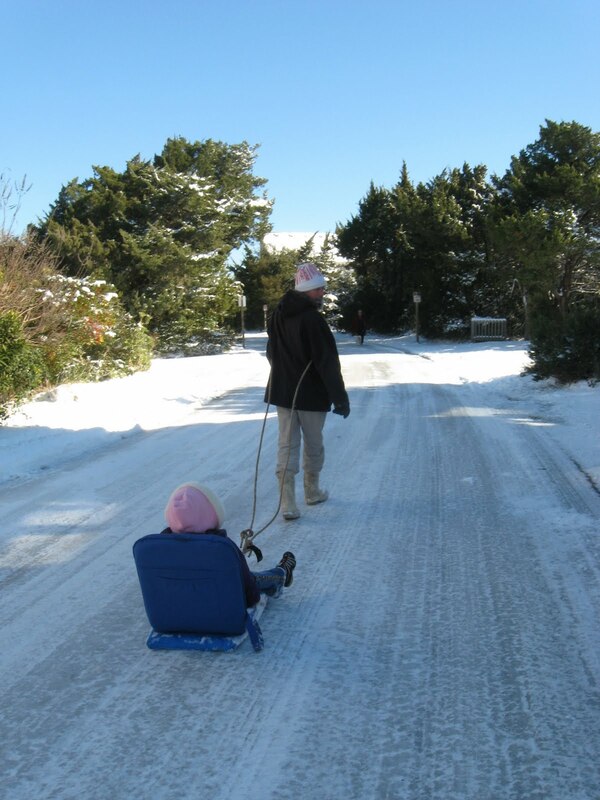 Life is quiet on Ocracoke during the winter months -- actually just as we like it, at least for a while. So there's not much to report...but part-time island resident, George Brown, was kind enough to share a couple of his off-season photos. 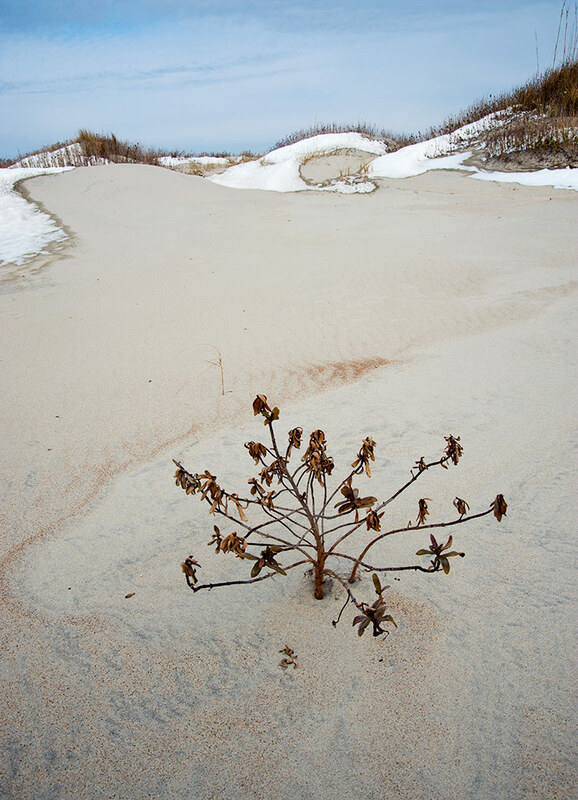 He thought our readers would enjoy these two winter beach scenes. You can see more of George's images at http://www.pixadilly.com/. I haven't looked carefully at the schedule, but I'm told that several times have been changed just slightly. 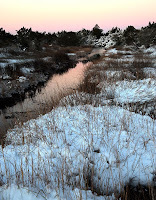 I thought our readers might enjoy a couple of photos Lou Ann made while she was here on Ocracoke over the holidays. They may not look much different from some of your summer photos, but if you imagine the cold, biting wind, and the deserted beach and nature trail you might be able to transport yourself to the island for a few brief moments (or maybe you already know exactly what it's like because you are fortunate enough to live on this wonderful island year-round!). Click on either photo to view a larger image. Enjoy!